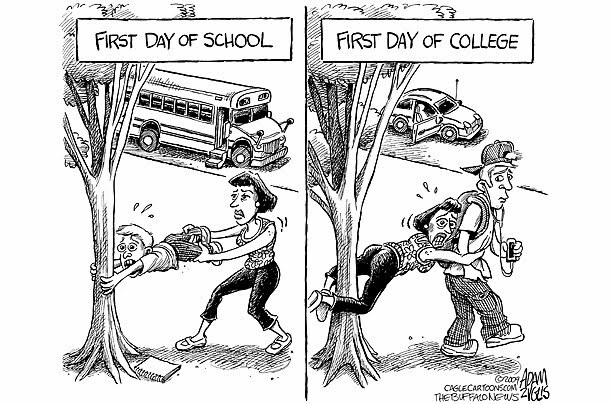 All across the country, impressionable, excited, young people are beginning their first days at college as they begin their journeys down their chosen career paths. High school is behind them, and adulthood now beckons. College will likely lead to load of new opportunities and experiences, both inside the classroom and out. So as the 2013 maritime trainees begin their voyage Clyde Marine Training asked some old hands, “what do you wish you’d known on your first day at college?” Here’s their top ten pearls of wit and wisdom. 1. “I wish I had known how important all course work was rather than concentrating on the parts I enjoyed most.” There are some things you are just better at than others, that’s the case in all walks of life. However everything is being taught for a reason, and no matter how difficult or boring you find it try and take it in. Enjoy the subjects you naturally excel at but make it your business to try and master the other subjects too, because you’ll need them in the future and you’ll be grateful for the time you invested in them when you had the opportunity. 2. “I needed to be self-disciplined, I wasn’t at school now.” You might still be in a learning environment, still sitting in a classroom but you are most definitely not at school now. It’s up to you to keep up, to listen, to ask if you don’t understand and to put the time and effort in. No one else is going to do it for you. That’s what being an adult is about. 3. “That I get seasick.” A popular piece of advice. You’ve signed up for a career at sea, well chances are you might get seasick at some point, so go find all the seasickness remedies you can and have them handy should that day ever arrive. The good news is you are not alone almost everyone who works at sea goes through this at some point. 4. “That it was an HB2 pencil I needed.” Know the tools you’ll need to master your trade. If you don’t know make it your business to find out. Be it for college work or your time at sea make sure you know well in advance what’s supplied and what you need to source, don't wait until the last minute and don’t expect someone else to do it for you. 5. “I can pass this because I’m a smart [person].” Self-confidence is a quality that’s so elusive to many at school. Here’s the thing; you passed your exams, you gained entry to this course, many others didn’t and lots of people out there are envious of you. Don’t be cocky, but understand that you wouldn’t have been accepted onto the course if some very smart people didn’t think you had what it takes to make it. You are more than capable of achieving the grade, it just takes some hard work and application. 6. “How much knowledge of Math I would need! I didn’t pay that much attention at school and the majority of the navigation and stability subjects are math-based so I had a lot of hard work to do.” Yip, for those who wondered what the point of Math was in real life you are about to find out. But here’s the thing, you can master it, you wouldn’t be here if that wasn’t the case. 7. “What going to sea is actually like. It’s hard work and continual learning when you are on board, it can be difficult but you’ve just got to get stuck in.” This is the real jump. College feels like a logical progression from school, but time at sea is different, its work. The environment is different, the attitude is different and the conditions are different. It’s also the reason why you are here in the first place, this is your chosen career and it’s a great industry, but be prepared for it. 8. “I wish I’d realized that technology would change so much.” What you learn today will always be valuable, but how you use it will change. Technology advances, do your best to keep up with it because it won’t wait for you. 9. “Enjoy yourself, just not too much!” Your college years are great, you’ll make new friends, visit new places and experience new things. That’s important. You’ll also socialize, a lot. There will be parties, evenings out, weekends away and impromptu events you’ll always remember. Embrace them because they are an important part of being young and of college life. However, find the balance and don’t let your social life become your whole life. 10. “Don’t be afraid to take notes and ask questions.” Simple, yes? Yet so many students find this difficult, speaking up in front of your peer group seems to terrify some. Remember, the onus is on you to learn, there will be some things you’ll not fully understand first time, don’t be afraid, the lecturers welcome questions and want to help you. Asking a question means you’re smart, not the opposite.